Air France/KLM Flying Blue wants your best travel pictures from around the world. Three winners will receive 200,000 Flying Blue miles, Platinum-level elite membership for one year, and their photo will be placed on Flying Blue luggage tags for elite members. Phtotos will be judged by a panel of three “experts” and the contest ends on 09 July 2014 at midnight in France. You can enter up to 10 photos in the contest. There are two ways to enter–online at Flyingblue.com or on Instagram. Take a travel photo (hereinafter the “Photograph”). From the home page, click on the heading “Post my photo” and click on the “Upload” button. Register by completing the form provided. For this, it is necessary to enter your name and email address. Upload the Photograph and publish it in the space provided for this purpose. Click on “Accept Competition rules” then “Confirm” to register the entry. Take 1 photo of a landscape (hereinafter the “Photograph”). Upload and post the Photograph on your Instagram account taking care to add the caption “#flyingview”. 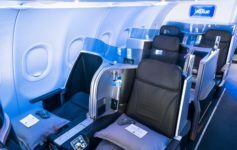 Matthew, United is changing to earning award miles based on revenue! We need your thoughts! !